Our first day of our tour (or I guess third if you count the two days getting there), we had rain the night before. 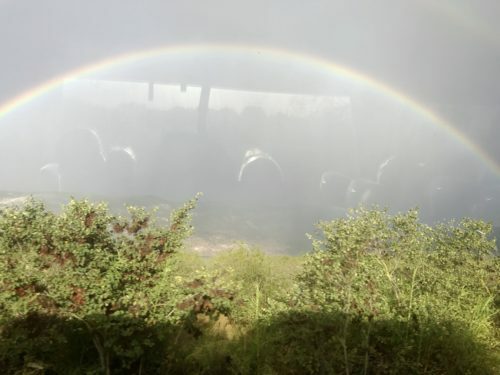 It was their first rain in seven months and the morning ride on the bus still had us being sprinkled on — what did we see? The most beautiful, vivid rainbow I have ever seen. 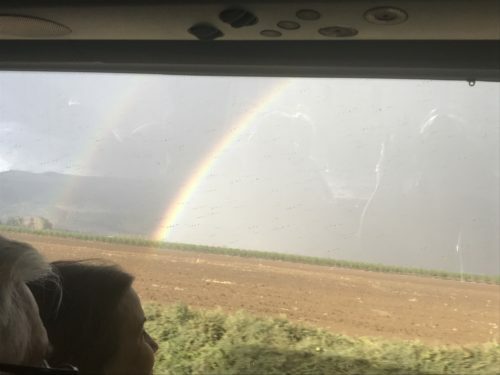 It was from end to end and you could see the lines of color so clearly and what happened next took us all by surprise — another rainbow appear on top of the first rainbow. What a way to start our trip. 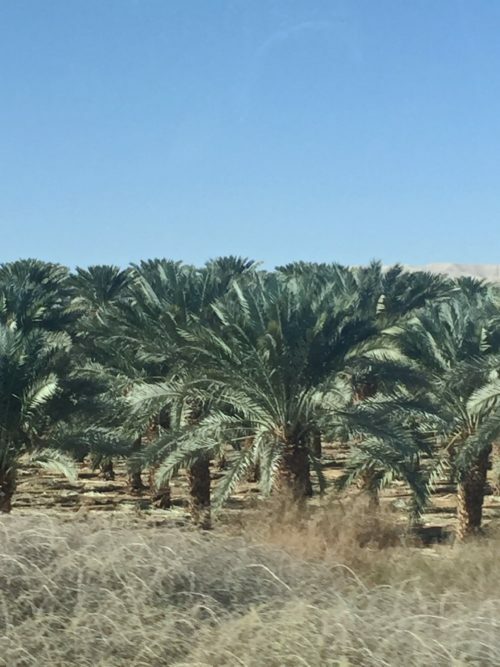 Two things I ate ever meal (including breakfast) were dates and olives. I couldn’t get enough of them and I had to buy dates before leaving and I came away with about six pounds.. What did I do with them? Well one box I divided up and gave to my kids and I made some of my Coconut Date Skillet Candy to donate to our craft circle bazaar. And then I made this salad when we had some friends over; and this recipe could either be a cold salad or a warm side dish. 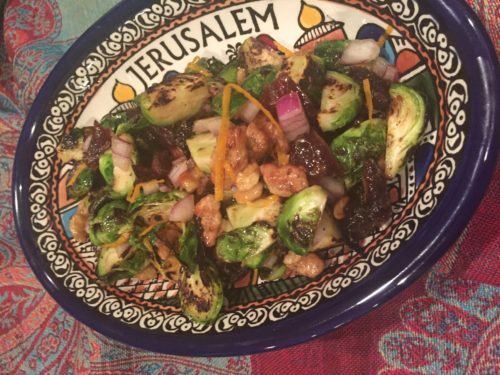 I’ve never been a fan of Brussel sprouts but I have found several salad and side dish recipes that I really love. So, look under “sides” and “salads” for some of my other BS recipes. 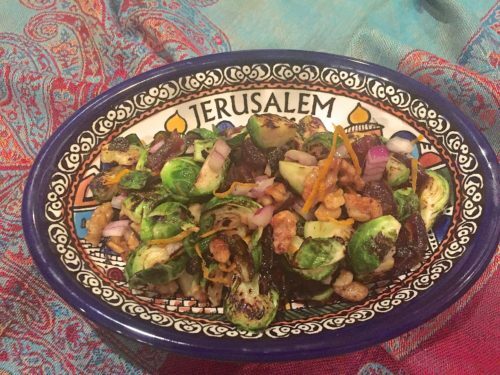 Why not give this salad/sidedish a try for your Thanksgiving dinner; this recipe is just as good served warm. 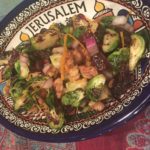 BLAST FROM THE PAST: Bacon Wrapped Brussel Sprouts is a favorite appetizer of mine; sweet and salty with a fig that could be changed to a date. Not many ingredients to this salad and pretty easy to make. 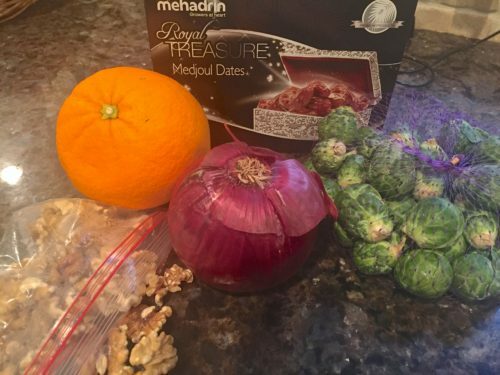 The Brussel sprouts are tossed with some Blood Orange Olive Oil (can use regular) and sautéed for about 10-15 minutes until they start to brown and get a little tender. Brown the chopped walnuts in a little butter until toasty brown. Toss all the ingredients together with a few tablespoons of the dressing and either eat warm, room temperature or chill (I did to take to bunco group) and serve cold. Taken from the other side of the bus through the window with a little rain so doesn’t look as impressive as it did seeing it in person. But, a full (double) rainbow was unbelievable. See that second rainbow? Most beautiful site to start the day. 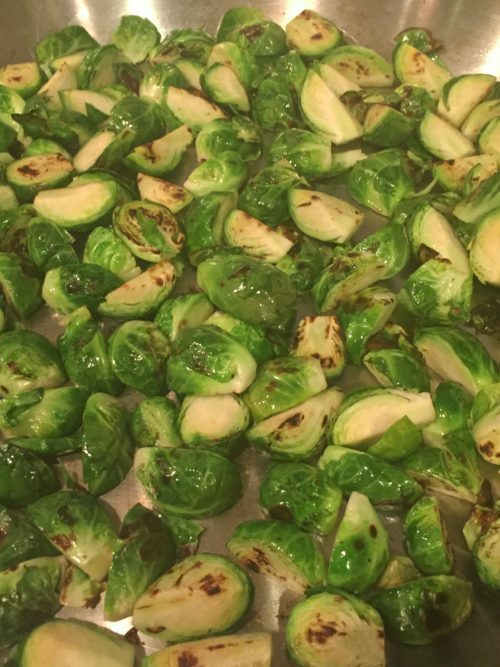 Toss the quartered Brussel sprouts with the olive oil. Heat a skillet and add the sprouts and stir until lightly toasted/brown. Remove from skillet and put in bowl. Make the dressing my mixing all ingredients together until well blended. 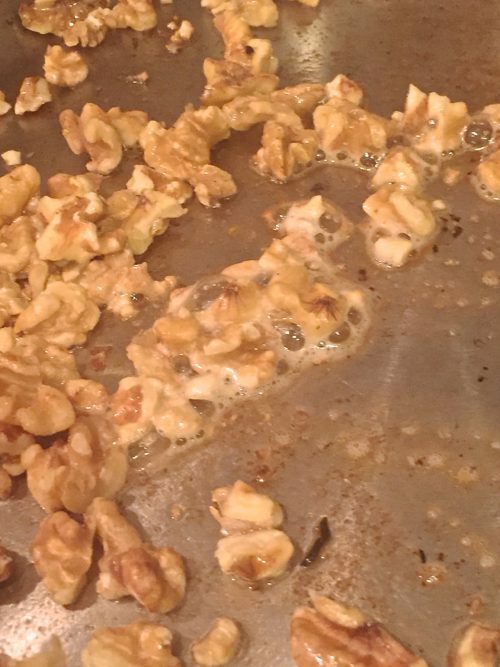 Put the butter in another skillet and when melted add the walnuts and stir until lightly toasted. Remove from skillet. 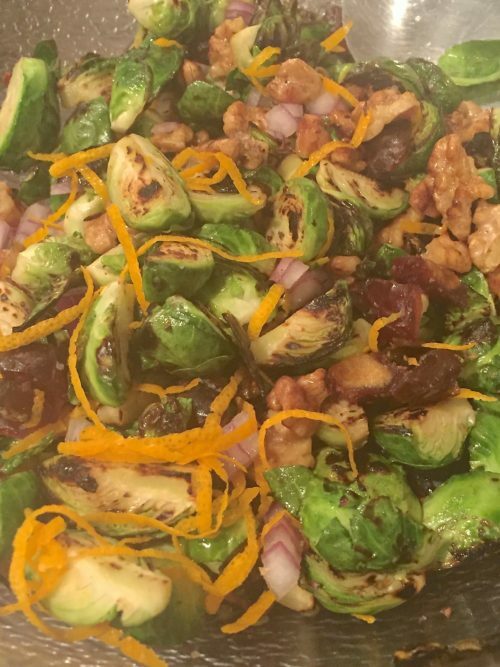 Mix the sprouts with dates, onion, orange zest, walnuts and enough dressing to lightly coat. Salt and pepper to taste.